Defending champion Roger Federer started his 2018 campaign for a sixth Australian Open crown on Tuesday night with a confident performance on Rod Laver Arena. The World No. 2, who is competing in his 19th tournament at Melbourne Park, defeated Aljaz Bedene of Slovenia 6-3, 6-4, 6-3 in one hour and 40 minutes. The Swiss star is now 88-13 lifetime at the first Grand Slam championship of the year. Federer will next challenge Germany’s Jan-Lennard Struff, who hit 45 winners, including 19 aces, past wild card Soonwoo Kwon of South Korea in a 6-1, 6-2, 6-4 victory in 77 minutes. Federer had plenty of rhythm against the Slovenian, as he broke Bedene's serve in the fourth game in the first set and won 16 of his 20 first-service points, including three straight love holds. The 36-year-old seized control of the match with a break at the start of the second set to leave Bedene winless in six appearances in Melbourne. Asked in his post-match press conference about the return of six-time Australian Open champion Novak Djokovic, who was victorious in his first match since retiring in the quarter-finals at 2017 Wimbledon, Federer said he was not surprised to see his great rival in good form. "I do maybe think if you put Rafa, myself and Novak together, I think because we have margin maybe against a lot of the players normally, when we do come back, we can find that level," Federer said. "Even though we're not feeling good, we can still find a way and eventually play good again, whereas others would struggle early on and it becomes more difficult." 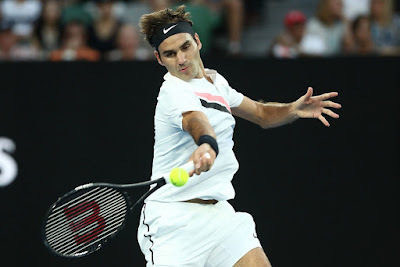 Federer is attempting to retain his Australian Open trophy one year after beating four Top 10 players in the ATP Rankings en route to his first Grand Slam title in five years (2012 Wimbledon). He would go on to win two majors (Australian Open, Wimbledon) and three ATP World Tour Masters 1000s (Indian Wells, Miami, Shanghai) among seven total trophies in 2017. "I am hoping for another good year," said Federer, who has won 19 Grand Slam championships. "I am not sure it will go that well because I'm a year older, Rafa's looking in tip-top shape and other guys are coming back. “Last year was a fairytale and I can't control everything. I am hoping to stay healthy and give myself chances and hope to play my very best in the big matches."